The Email Templates Manager provides a convenient visual editor to edit system emails. No need to create transactional emails for each store and link them in Magento config anymore. Typically to change texts or translate something you create a transaction email. There are a lot of system emails in Magento and if you have multiple websites this is a lot more transactional emails. Not useful, a lot of actions to change something. 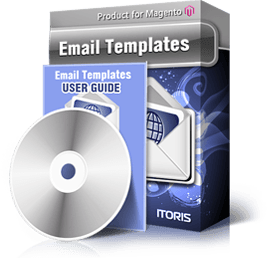 The Email Templates Manager simplifies the process greatly. The extension deals with system email templates directly bypassing the transactional emails. You have the list of system email templates and the configuration scope with all your store views. Pick up a store view (or leave the default config to edit it for all store views) and a email template to edit. The WYSIWYG appears below for you to edit the email subject and body for selected template. No page reloads, everything is done using AJAX. Natively Magento doesn't provide WYSYWYG for transactional emails. Using the Email Templates Manager you enable the rich-text editor. Natively Magento doesn't allow to add CC and BCC to emails. Now you can set one or several emails in CC/BCC fields to receive a copy on your additional email address. Natively Magento doesn't allow to edit the "from name" and "from email" fields for each email template. Make it possible with our extension. Natively Magento doesn't allow to attach files to email templates. The extension allows that. If you need to attach agreements, demos, additional documents to your emails the Email Templates Manager will be of help. In addition, the extension helps to fight the SPAM issue, when emails from your store come to Spam or Junk folder of mailbox. The issue happens because Magento doesn't add tags and to emails in HTML format. The Email Template Manager solves the issue.